Proposals for this special section are due by 1 June 2017 and full discussion articles will be due by 31 August 2017. Please send proposals to Vanessa K Váldes at vkv@smallaxe.net. On March 2, 1917, the Jones‑Shafroth Act was signed, conferring U.S. citizenship to inhabitants of Puerto Rico, the territory it had annexed at the conclusion of the Spanish-Cuban-American War of 1898. 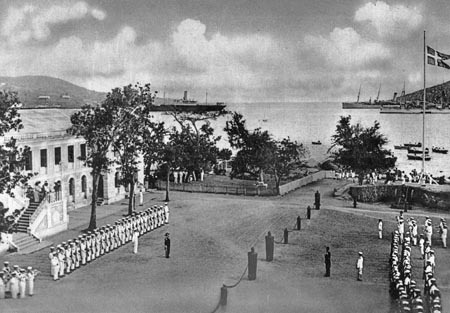 1917 marked the third year of a U.S. military occupation in Haiti that would last for seventeen years: during the first months of the year, the Haitian legislature rejected a version of the constitution drafted by the U. S. State Department which included a provision that allowed for foreign ownership of land, a feature that had been excluded in previous constitutions. In the Dominican Republic, 1917 marked the first year of a war of resistance against the U.S. military occupation happening in that country; this guerrilla war would last five years. Finally, the year would see the end of Indian indentured labor in the British Empire, including the colonies of Guyana, Trinidad, and Jamaica. In commemoration of the centennial of these events, sx salon: a small axe literary platform seeks discussion essays that examine how these historical moments are reflected in the region’s literature, then and/or now. How did literary writers of the time respond? Given the ongoing legacies of these occurrences, how have writers of later generations interpreted this critical year in the region? This special section on the centennial of 1917 is slated for publication in October 2017. Discussion articles are typically 2000-2500 words and offer a targeted exploration of the topic. sx salon, launched in 2010 as part of the Small Axe Project, is an electronic publication dedicated to literary discussions, interviews with Caribbean literary figures, reviews of new publications (creative and scholarly) related to the Caribbean, and short fiction and poetry by emerging and established Caribbean writers. View past issues and submissions guidelines here.